Loyola Marymount University traces its history through Loyola College, founded in 1917 as the successor to St. Vincent's College which was founded in 1865, and Marymount College, founded in 1933 with its roots in Marymount School which was founded in 1923. Loyola Marymount, which sits atop the bluffs overlooking Marina Del Rey and Playa Del Rey is the parent school to Loyola Law School located in downtown Los Angeles. 1.2 Beginnings of Loyola in L.A.
1.3 Beginnings of Marymount in L.A. The names " Loyola" and " Marymount" have long been associated with Catholic higher education in countries around the globe. Saint Ignatius Loyola, founder of The Society of Jesus, sanctioned the foundation of his order's first school in 1548. 1. In 1865, the Vincentian Fathers were commissioned by Bishop Thaddeus Amat y Brusi to found St. Vincent's College for boys in Los Angeles. Father John Asmuth, C.M., served as the first President Rector. Classes were held for two years in the Lugo Adobe on the east side of the Plaza while a new building was being finished. The historic home, aptly donated by Don Vicente Lugo, was one of few two-story adobes then in town. The house stood in the empty lot across Alameda Street between the Plaza and Union Station, (near Olvera Street). 2. After two years, the college and school moved into a new, brick building several blocks south by the lower plaza, Pershing Square. Beginnings of Loyola in L.A. Beginnings of Marymount in L.A. In separate though parallel developments, the Religious of the Sacred Heart of Mary began teaching local young women in 1923. Having been invited by Bishop John Cantwell, seven sisters of the Religious of the Sacred Heart of Mary, under the leadership of Mother Cecilia Rafter, R.S.H.M., formed what was first an elementary school and, shortly thereafter, a high school. Within ten years, so many young women wished to continue their education with the Marymount sisters beyond high school that Marymount Junior College opened as an all-women's school on the Westwood campus of Marymount High School in 1933. Mother Gertrude Cain, R.S.H.M., served as the first president of the junior college and guided its development into a four-year college in 1948, assuming the name Marymount College of Los Angeles. In 1960, having outgrown its shared Westwood campus, Marymount College moved both its two-year program and its four-year program to the Palos Verdes Peninsula in southwestern Los Angeles. The Palos Verdes campus became Marymount California University. In 1967 Sister Raymunde McKay, R.S.H.M., D.Phil., the president of Marymount College, extended an invitation to Sister Mary Felix Montgomery, C.S.J., Ph.D., General Superior of the Sisters of Saint Joseph of Orange, to merge Marymount College with St. Joseph College of Orange, a four-year liberal arts college for women religious run by the Sisters of Saint Joseph of Orange, which Sister Montgomery accepted. St. Joseph College was originally formed as St. Joseph Teacher's College, a junior college affiliated with The Catholic University of America in 1953. In 1959 it was incorporated as an autonomous, four-year institution and assumed the St. Joseph College name. In 1968 Marymount and St. Joseph's Colleges merged under the Marymount name with an agreement that the traditions and heritage of both the Religious of the Sacred Heart of Mary and the Sisters of St. Joseph of Orange would be carried in the Marymount name. As part of the Marymount College Agreement, Marymount College was administered "co-equally" by the Religious of the Sacred Heart of Mary and the Sisters of St. Joseph of Orange as members of both communities partnered in the governing, staffing, and teaching of Marymount College. By the mid-1960s, Loyola University of Los Angeles had unsuccessfully petitioned the Archbishop of Los Angeles, Cardinal James Francis McIntyre, to allow coeducation at Loyola for several years. In 1967, however, Sister McKay, President of Marymount College, received permission from Cardinal McIntyre to begin affiliation with Loyola University on Loyola's Westchester campus. Sister McKay and Father Charles Cassassa, S.J., Ph.D., President of Loyola University, held a joint press conference to announce the affiliation. 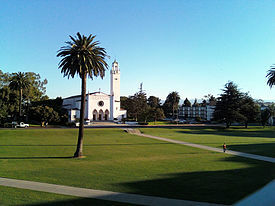 The affiliation of Marymount College and Loyola University began in 1968 when Marymount's four-year program moved to Loyola's Westchester campus; this arrangement (two independent schools on one campus) continued for five years. In 1970, the Student Governments of Loyola University (ASLU—Associated Students of Loyola University) and Marymount College (ASMC—Associated Students of Marymount College) joined to form the Associated Students of Loyola and Marymount (ASLM). After five years of sharing faculties and facilities, Loyola University and Marymount College merged and assumed the name Loyola Marymount University in 1973. Through this union, the expanded university maintained the century-old mission of Catholic higher education in Los Angeles and incorporated the educational traditions of the Jesuits, Marymount sisters, and Orange sisters into one institution. At this time, ASLM became known as the Associated Students of Loyola Marymount University (ASLMU). LMU acquired the 1,000,000-square-foot (93,000 m2) building in January 2000 from Raytheon, which bought Hughes Aircraft. LMU completed the interior remodel of approximately 250,000 square feet (23,000 m2) in April 2001. The building, which houses the university's Bellarmine College of Liberal Arts, is constructed of steel and concrete and is divided into seven structures above ground. University Hall has over 500,000 square feet (46,000 m2) of floor space and contains over 1,000 parking spaces in three underground levels. The 70,000 square feet (6,500 m2) of atrium space is and will continue to be the venue for many LMU events. University Hall was featured in season one, episode two of the television series Bones, as the fictional "Hamilton Cultural Center" in Washington, D.C.
Hannon – Built 1978. Houses 270 students. Largest apartment complex on campus. Named for Eugenia B. Hannon. Tenderich – Built 1968. Houses 144 students. Named for Ernst and Gertrude Tenderich. O'Malley – Built 2000. Houses 160 students. First apartment complex built on Leavey campus. Named for Thomas P. O'Malley. Leavey 4 – Built 2002. Houses 178 students. Leavey 5 – Built 2002. Houses 176 students. The Hollywood Reporter, in its "Top 25 American Film Schools" 2014 edition , 2015 edition , 2016 edition , 2017 edition , and 2018 edition  ranked Loyola Marymount 8th in the country. The Department of Music has long been known for its choral organizations. Two choruses provide singing opportunities for a broad cross section of the university community. Promoting the university's long tradition, the 100-voice Concert Choir presents music for mixed voices. The smaller, more advanced Consort Singers presents varying styles of choral music and frequently appears in the Los Angeles area as the ambassador group for the university. The Frank R. Seaver College of Science and Engineering sees its purpose to be the education of principled leaders. It contains thirteen undergraduate programs of study as well as six graduate programs. Graduate programs are offered in civil, electrical and mechanical engineering, in environmental science, in computer science, in systems engineering, and in dual program called systems engineering and leadership (SE+MBA) . The college was ranked 19th nationally by U.S. News & World Report's "2005 Best Colleges Guide" in the category of institutions whose highest degree is a bachelor's or master's. The School of Film and Television offers bachelor's degrees in Film and Television Production, Screenwriting, Animation, and Recording Arts along with a minor in Film Studies and also Master's programs in Writing and Producing for Television, Film and Television Production, and Feature Film Screenwriting. A range of advanced facilities and equipment are available to students, including two soundstages, advanced editing labs, a fully equipped theater, and top of the line camera equipment including five RED One Cameras. The School of Film and Television also offers a wide range of internship opportunities through more than 400 partner companies. The governing body of the university is the school's independent board of trustees, headed by a chairman. The university's executive officer is the president. Prior to 2009, a prerequisite to serve as the university's president was membership in the Society of Jesus; however, the board of trustees voted to allow educators not a part of the Jesuit Order to become president. These changes were made at the recommendation of the American Assistancy of Jesuits, the collective body of Jesuits in the United States in response to the declining number of Jesuits as well as those prepared to serve as the president of a major university. See a list of past presidents. The president is assisted by the chancellor, assistant to the president, director internal audit, the vice president for mission and ministry (under whose direction the Office of Campus Ministry and the Center for Ignatian Spirituality operates) and the vice president for intercultural affairs. The executive vice president & provost reports directly to the president and oversees all campus operations. Loyola Marymount's Office of Campus Ministry is a component to the promotion of the university's mission and identity. Founded in 1911 as the University Chaplain, this division became known as Campus Ministry in 1973 with a stipulation that the Director would be a Jesuit. By 1986 this requirement was waived when Sr. Margaret Mary Dolan, R.S.H.M. became the director. Dolan, an alumna of Marymount College's class of 1958, received her Master's from LMU in 1974 and also served the university as a campus minister, director of alumni relations, residence hall minister, and alumni chaplain since 1973. 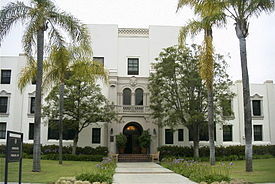 Founded in 1991, the Marymount Institute was designed to help strengthen the legacy and contributions of the Marymount tradition at LMU, and encourages interdisciplinary and intercultural scholarly and artistic activity in the form of research, publication, exhibits, performances, conferences, seminars, and lectures. 2008 saw the opening of the Marymount Institute Press. Itself an imprint of Tsehai Publishers and Distributors, the MIP was founded by the Ethiopian-born journalist, publisher, and social activist, Elias Wondimu, and already has two publications to its credit: "Panim el Panim: Facing Genesis, Visual Midrash" and "A Journey into Love: Meditating with Piers Plowman". Athletic teams at Loyola Marymount are known as Lions; the school's primary athletic affiliation is with the West Coast Conference. While LMU has had success in several sports, it is probably best remembered for its men's basketball teams between 1985 and 1990, with Paul Westhead as coach and for the death of star player Hank Gathers (#44), who collapsed during the second round of the WCC tournament on March 4, 1990, and for his friendship with teammate Bo Kimble (#30). Their jerseys have been retired at LMU. Especially well-remembered was the 1990 team, led by Gathers and Kimble until tragedy struck in the WCC tournament. Gathers collapsed during a game and died due to a previously diagnosed heart condition. Playing for their fallen teammate, the Lions advanced to the Elite Eight (regional final) of the NCAA tournament before falling to eventual champions UNLV. The Los Angeles Loyolan newspaper has been published for more than 90 years. It was originally titled The Cinder for the cinders kicked up by the trains passing the downtown campus of St. Vincent's College. In 2007, The Loyolan moved from its long standing weekly Wednesday publication schedule to a twice a week—Monday and Thursday—schedule. It has since returned to a weekly Wednesday publication schedule. The paper is supported by its advertising department, which has historically paid from 80% to 100% of the cost of publication. Its regular sections include News, Opinion, Sports and Life+Arts. Special sections include Business, Travel, Cartoon and the parody section, named The Bluff after LMU's distinctive landmark. In 2005, the paper won the Columbia Scholastic Press Association award for "Best Four-Year Weekly Tabloid." In 2011–2012, the Loyolan's website, laloyolan.com, won a Gold Crown, presented by the Columbia Scholastic Press Association. The honor is one of eight awarded to college newspapers nationwide for website excellence. This was the first time in the Loyolan's history that it won a Gold Crown for its website. The newspaper has won three Newspaper Pacemaker Awards for exceptional college journalism, presented by the Associated College Press and the Newspaper Association of America Foundation in recognition of general excellence and outstanding achievement by a college newspaper. The publication won in 2007, 2011 and, most recently, in 2013. Over the years, the Loyola University Los Angeles yearbook was known by several titles, including the Lair Annual. After the merger the university began publishing the annual Tower Yearbook which is financed through a mandatory annual student yearbook fee (collected along with tuition). In 2016, the National Scholastic Press Association awarded the Tower yearbook the prestigious Pacemaker Award. SEEK, the winning issue was headed by Mali McGuire the editor-in-chief for the year. The 2015-16 yearbook was also awarded the Gold Crown by the Colombia Scholastic Press Association. KXLU (88.9 FM) is an FM radio station broadcasting out of Loyola Marymount University in southwest Los Angeles, California. It was first on the air in 1957, and recently celebrated its 60th anniversary. It is a non-commercial college radio station that plays many styles of music broadly classified under rock, specialty, fine arts, and Latin jazz. KXLU has an annual fundraising drive known as "fundrazor" which supports the station's ongoing operation. The station has a large following in the Los Angeles area. KXLU is also the 'flagship' station for LMU athletics featuring every Lions Men's basketball game each season. ROAR Network is the newest student media on-campus. It provides a forum for student produced programming to be broadcast both via the on-campus cable TV system and, eventually, via the Public-access television cable TV system(s). Unique to Loyola Marymount is its Center for Service and Action (CSA). Dedicated to fostering the Jesuit principles of the service of faith and promotion of justice, CSA offer students opportunities to serve the campus and surrounding communities. The mission of CSA is to educate and form men and women with and for others, especially with and for the disadvantaged and the oppressed. One of the many opportunities provided by CSA to students looking to do service work is the Alternative Break Program. LMU's Alternative Breaks program promotes service and cultural exchange on the local, national, and international level through hands-on, community-based learning. Students are immersed in diverse contexts throughout the world with concrete challenges that heighten social awareness. CSA also oversees LMU's student service organizations. The ten service organizations work to help the university and surrounding community of Los Angeles. Each service organization has its own unique mission, history, charism and organizational structure. The members of these organizations make themselves available for on-campus service as well as on-going commitments to serve at specific non-profit agencies in Southern California. Each organization has a moderator and a chaplain (though in some of the organizations the same priest or woman religious serves as both moderator and chaplain). The Center for Service and Action works with the service organizations in fostering on-campus service and community service as well as reflecting upon their experience of service. CSA coordinates communication between the leadership of these organizations, the Service Organization Council. CSA also coordinates the distribution of the On-Campus Service Requests. ^ As of 2017. "U.S. and Canadian Institutions Listed by Fiscal Year (FY) 2017 Endowment Market Value and Change in Endowment Market Value from FY2016 to FY2017" (PDF). Archived from the original (PDF) on 2018-03-06. Retrieved 2018-01-30. ^ "LMU At A Glance" (PDF). Loyola Marymount University. Retrieved May 17, 2013. ^ a b c "Loyola Marymount University Common Data Set 2015–2016, Part B" (PDF). Loyola Marymount University. Archived from the original (PDF) on 2016-03-12. ^ "Loyola Marymount University Sports". Retrieved April 25, 2018. ^ a b c Thursby, Keith (2010-03-03). "Donald P. Merrifield dies at 81; former president of Loyola Marymount". Los Angeles Times. Retrieved 2010-03-10. ^ University, Loyola Marymount. "History - Loyola Marymount University". Lmu.edu. Retrieved September 2, 2017. ^ See description in watermark. ^ Historic Core of Los Angeles, amazon.com; accessed June 10, 2018. ^ a b "St. Vincent history". Archived from the original on May 27, 2016. Retrieved September 2, 2017. ^ Chaim Shapiro, 1910-13, and several graduates of the class of 1915. "Stare Decisis", USC law school yearbooks for 1913 and 1915, on file in USC Libraries archives. ^ "Alumni - Loyola Law School, Los Angeles". Alumni.lls.edu. Retrieved 25 April 2018. ^ "LMU Magazine : No One Left Behind". Retrieved 25 April 2018. ^ a b c d "Former LMU President Donald Merrifield, S.J. Dies at 81". Loyola Marymount University. Archived from the original on 2011-07-19. Retrieved 2010-03-10. ^ Gordon, Larry (2010-03-03). "President of Loyola Marymount University to step down, cites back surgery". Los Angeles Times. Retrieved 2010-03-15. ^ "Interim president David Burcham named 15th president of LMU". The Argonaut. Southland Publishing Inc. 2010-10-07. Retrieved 2018-09-24. ^ Song, Jason (2015-03-29). "Timothy Law Snyder chosen to lead Loyola Marymount University". Los Angeles Times. Retrieved 2018-09-24. ^ "Test Prep - Online Tutoring - College & Grad Admissions - The Princeton Review". Princetonreview.com. Retrieved 2 September 2017. ^ "Leavey Student Apartments 4, 5 & 6". Website. Archived from the original on 31 March 2012. Retrieved 22 August 2011. ^ "LMU Helps Lead the Way to a Greener L.A." Loyola Marymount University. Archived from the original on 2011-09-27. Retrieved 2009-09-10. ^ "Built Environment". Loyola Marymount University. Archived from the original on August 14, 2009. Retrieved 2009-09-10. ^ "Loyola Marymount University - Green Report Card 2010". Greenreportcard.org. 2008-06-30. Retrieved 2013-08-31. ^ "Sustainable Endowments Institute". Endowmentinstitute.org. Retrieved 2013-08-31. ^ a b c "Loyola Marymount University Common Data Set 2015–2016, Part C" (PDF). Loyola Marymount University. Archived from the original (PDF) on 2016-03-12. ^ "Loyola Marymount University Common Data Set 2014–2015, Part C" (PDF). Loyola Marymount University. Archived from the original (PDF) on 2016-03-12. ^ "Loyola Marymount University Common Data Set 2013–2014, Part C" (PDF). Loyola Marymount University. ^ "Loyola Marymount University Common Data Set 2012–2013" (PDF). Loyola Marymount University. ^ "Loyola Marymount University Common Data Set 2011–2012, Part C" (PDF). Loyola Marymount University. ^ "Loyola Marymount University Common Data Set 2018-2019" (PDF). ^ "Loyola Marymount University". U.S. News & World Report. Retrieved February 23, 2016. ^ Stockstill, Mason (2019-02-06). "Loyola Marymount University Sets Another Record for First-Year Applications". LMU Newsroom. Retrieved 2019-04-05. ^ "2019 US News Rankings of Loyola Marymount University". ^ "Loyola Marymount University - The Top 25 Film Schools in the United States 2014". The Hollywood Reporter. Retrieved 2019-04-05. ^ "Ithaca College - The Top 25 Film Schools in the United States 2015". The Hollywood Reporter. Retrieved 2019-04-05. ^ "Loyola Marymount University - THR Ranks the Top 25 American Film Schools". The Hollywood Reporter. Retrieved 2019-04-05. ^ "1. USC - The Top 25 American Film Schools 2017". The Hollywood Reporter. Retrieved 2019-04-05. ^ "8. Loyola Marymount University - The Top 25 American Film Schools". The Hollywood Reporter. Retrieved 2019-04-05. ^ "Kaplan Says LMU is Cutting-Edge". Lmu.edu. 2008-05-05. Archived from the original on 2013-09-09. Retrieved 2013-08-31. ^ a b "Bloomberg Businessweek: Business Schools, Rankings & Profiles (Part-Time MBA programs)". Bloomberg Businessweek. Archived from the original on 2013-11-30. Retrieved 2013-12-01. ^ List, The Chronicle (2018-02-18). "Top Producers of Fulbright U.S. Scholars and Students, 2017-18". The Chronicle of Higher Education. ISSN 0009-5982. Retrieved 2019-04-07. ^ "CEO and Publisher of Hispanic-Market Publications El Clasificado and Al Borde appointed to Loyola Marymount University Board of Regents". HispanicBusiness.com. 2006-10-18. Archived from the original on 2012-09-09. Retrieved 2013-08-31. ^ a b c d e University, Loyola Marymount. "Degrees & Programs - Loyola Marymount University". Lmu.edu. Retrieved September 2, 2017. ^ University, Loyola Marymount. "Studio Arts - Loyola Marymount University". Cfa.lmu.edu. Retrieved 25 April 2018. ^ University, Loyola Marymount. "Academics - Loyola Marymount University". Cfa.lmu.edu. Retrieved 25 April 2018. ^ "Best Colleges Rankings: Loyola Marymount University". U.S. News & World Report. Retrieved 2016-09-28. ^ Johnson, Ross (2005-05-22). "To Be as a City Upon a (Hollywood) Hill". The New York Times. Retrieved 2010-05-11. ^ "The Best Film, Video & Photographic Arts Schools". College Factual. 2013-02-20. Retrieved 2019-04-05. ^ "Loyola Marymount's new Playa Vista film school is a high tech wonder to behold – Daily News". webcache.googleusercontent.com. Retrieved 2019-04-05. ^ "USC Cinematic Arts | Copyright at SCA". cinema.usc.edu. Retrieved 2019-04-05. ^ "Notable LMU Alumni". LMU SFTV. Archived from the original on October 23, 2013. Retrieved October 22, 2013. ^ "Loyola Law School, Los Angeles". Lls.edu. Archived from the original on 2012-05-18. Retrieved 2013-08-31. ^ "LLS | Public Interest Law Department | Pro Bono Graduation Requirement". Intranet.lls.edu. Archived from the original on 2002-12-25. Retrieved 2016-09-28. ^ University, Loyola Marymount. "Executive Leadership - Loyola Marymount University". Lmu.edu. Retrieved September 2, 2017. ^ a b University, Loyola Marymount. "Board of Trustees - Loyola Marymount University". Lmu.edu. Retrieved 2 September 2017. ^ University, Loyola Marymount. "Campus Ministry - Loyola Marymount University". Mission.lmu.edu. Retrieved September 2, 2017. ^ a b University, Loyola Marymount. "Centers + Institutes - Loyola Marymount University". Lmu.edu. Retrieved 2 September 2017. ^ "Loyola Marymount Official Athletic Site". LMULIONS.com. Retrieved September 2, 2017. ^ "ASLMU: Meet the Team". ASLMU. Loyola Marymount University. 2015. Retrieved November 1, 2015. ^ Board, Editorial (2013-05-08). "Loyolan to shift to digital focus - Los Angeles Loyolan: Opinion". Laloyolan.com. Retrieved 2016-09-28. ^ "Home". The Tower. Retrieved 2 September 2017. ^ a b "Student media". Archived from the original on April 15, 2017. Retrieved September 2, 2017. ^ "Service". Archived from the original on April 15, 2017. Retrieved September 2, 2017. ^ "Greek Life". Studentaffairs.lmu.edu. Archived from the original on 2016-10-11. Retrieved 2016-09-28. Wikimedia Commons has media related to Loyola Marymount University. Panorama of historic St. Vincent's College, Loyola's original 1887 campus in downtown LA.